Nearly a decade ago, Natalie Carol left her home in Little Rock, Arkansas and headed to Los Angeles to pursue a career in music. With a voice reminiscent of a southern-born Patti Smith or Stevie Nicks, Carol has the sound and the look that would have fit in perfectly with the Laurel Canyon music scene of the 60s and 70s. 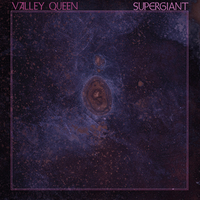 Her band, Valley Queen, with Neil Wogensen (bass/vocals), Shawn Morones (guitar), and Mike DeLuccia (drums) carries the rock spirit of the past in to the present. In 2016, the band released the singles "In My Place" and "High Expectations" on Canvasback Music/Atlantic Records to wide acclaim, and have played lauded shows at an array of venues, opening for Laura Marling, Reggie Watts, Thao & The Get Down Stay Down, and LP. They've been featured in the lineups at River Roots Live, NPR's Tiny Desk Contest Tour, Nelsonville, Lightning In A Bottle, and Willie Nelson's Luck Reunion. Valley Queen's premiere EP, Destroyer, was released in 2017 to critical praise. Produced by Lewis Pesacov (Best Coast, Nikki Lane, Fool's Gold, FIDLAR), "Stars Align" was named one of Bob Boilen's Top 50 songs of 2017 by NPR's All Songs Considered. The band spent the latter part of 2017 and early 2018 in the studio with Pesacov recording their debut full-length album, slated for release on Roll Call Records in summer 2018.